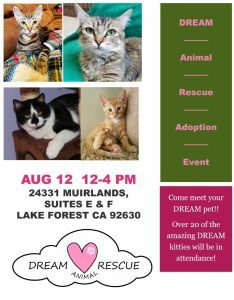 Come down to our Lake Forest Pet Adoption Center on Sunday, January 14, 2018, to meet the adoptable cats and kittens from DREAM Animal Rescue. Besides our available dogs and DREAM's cats in our cattery, DREAM will have additional cats and kittens brought in from their foster homes for adoption at our center from Noon to 3 pm. Come meet them all! It's time for the third annual South County Pet Expo! 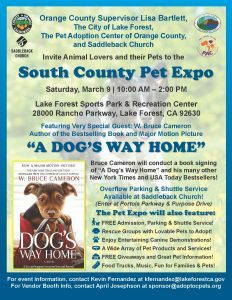 This extremely popular Free event will once again feature numerous rescue groups, vendors, demonstrations, and special guest, Bruce Cameron, author of "A Dog's Purpose." 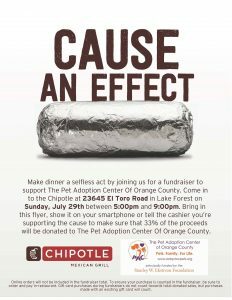 Join us Sunday evening July 29, 2018 from 5-9 pm, for our next dinner fundraiser at Chipotle Mexican Grill in the Home Depot center on El Toro Road near Rockfield in Lake Forest. Mention us, show our flyer, or print a copy and bring it with you. If you do, The Pet Adoption Center of Orange County will receive 33% of the proceeds. Enjoy some healthy and delicious food while you support us! It's time for our August food fundraiser. 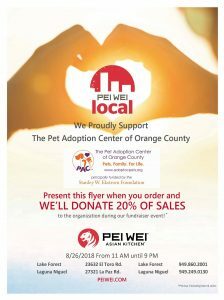 You can enjoy lunch or dinner at Pei Wei in Lake Forest or Laguna Niguel on Sunday, August 26th from 11 am - 9 pm. Show this flyer to support us. 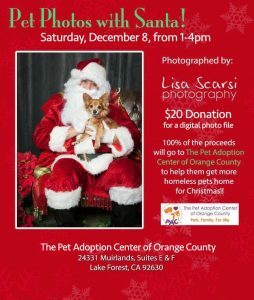 Bring your pets for Christmas photos with Santa at the Pet Adoption Center of Orange County on Saturday, December 8, 2018 from 1-4 pm. For a $20 donation, and $10 per additional pet, you'll receive a digital file. Thanks to Lisa Scarsi Photography and Santa Claus, for this special annual event. 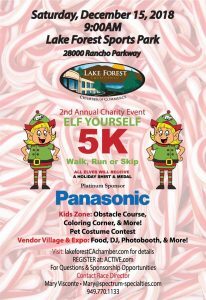 We'll be at the Lake Forest Sports Park, Saturday December 15, 2018, for the Second Annual Lake a Forest Chamber of Commerce Elf Yourself 5K and festivities. The Pet Adoption Center of Orange County will host a Pet Parade/Costume Contest at 10:30 am. Prizes will be awarded for Best Holiday-themed Costume, Best owner-pet lookalikes, and Most Creative Costume. You don't have to sign up for the 5K to participate in the festivities. Dress up your pet and come join us! It's time for the 4th Annual South County Pet Expo, coming to the Lake Forest Sports Park on Saturday, March 9, 2019, from 10 am - 2 pm. 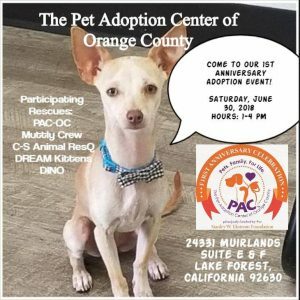 Sponsored by Orange County Supervisor Lisa Bartlett, The City of Lake Forest, The Pet Adoption Center of Orange County, and Saddleback Church. There will be plenty of pets to adopt, plus demos, vendors, and food. If you're interested in a booth or sponsorship, please click here.